Pastry SchoolEver wanted to make ace desserts, sweets, and baked goods but intimidated by the process? Welcome to **Pastry School**, a course from James Beard Award-nominated pastry chef Dana Cree. Editor’s note: Lucky Peach was a magical food magazine that existed from 2011 to 2017. It was beloved by readers, regarded as a destination publication for writers, and won a slew of James Beard Awards. After its untimely demise, the website—and all the stories it ever published—disappeared into the digital ether. In the spirit of resurrecting the dead (and because the copyright reverts to the author), The Takeout will be republishing stories from Lucky Peach’s archives—including Pastry School, written by James Beard Award-nominated pastry chef Dana Cree. Her first column: pastry cream 101. 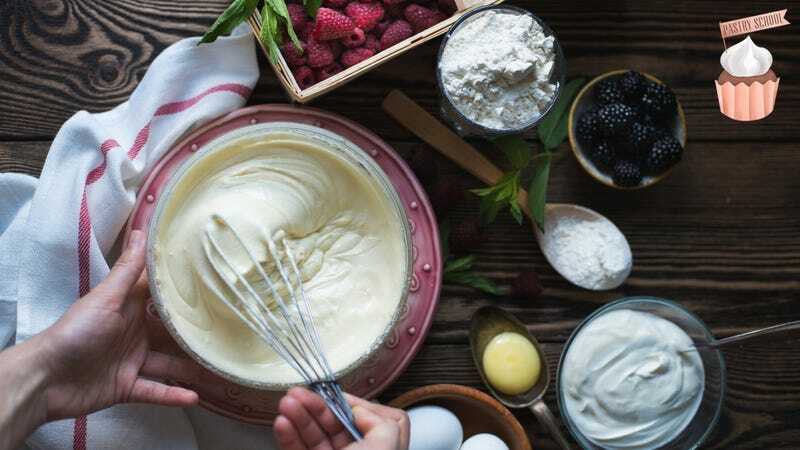 As its name suggests, pastry cream is the legitimate creme de la creme of the pastry world—and that’s saying something for a world so heavily populated with creamy things. But you’d be forgiven for not knowing about it: classic American desserts—cookies, brownies, fruit pies—are largely pastry-cream free. At its most basic level, pastry cream is a boiled custard similar to vanilla pudding. The custard itself contains egg yolks, milk and/or cream, and sugar, and is often finished by whisking in butter. This mixture is stabilized by the inclusion of flour and starch, which makes it thick and malleable, and prevents the egg from curdling during the cooking process. To begin making pastry cream, the milk and cream are heated to a boil along with any inclusion meant to perfume the cream. (Vanilla is most common, but teas, spices, and fresh herbs are also popular.) The hot cream is then poured gently into a mixture of whipped egg, sugar, and starch. Transferred back to a pot on the stove, pastry cream is cooked to a boil. The key: whisking constantly to ensure a smooth custard. After a brief boil, shorter if cornstarch is employed, longer for flour, butter is whisked in and the pastry cream is ready for its destiny. When it’s still hot, pastry cream takes to a variety of mix-ins: chocolate, coffee, and rum are all popular. Or, you can pour it into tart shells immediately after boiling, let it cool, and then top it with fruit for a classic fruit tart. Pastry cream’s greatest trick, however, is when it is left to cool in a pan. From there, it becomes the mother sauce to an endless variety of desserts. Our mother pastry cream has quite a brood, but not one to be tied down, every child of pastry cream has a different father. Her daughter, mousseline, is born of a moment between pastry cream and smooth soft butter, delicately folded together into pure velvet. Another coupling, between the tall proud Italian meringue bore our mother pastry cream the child chiboust, airy and light as chiffon. But add a little heat to that night, say, a 400-degree Fahrenheit oven, and the marriage of meringue and pastry cream swells into the ephemeral soufflé. Whipped cream and pastry cream have a small family unto themselves. Their first born, diplomat cream, rich and reserved, made from folding whipped cream and pastry cream together, has siblings. Add a touch of Grand Marnier, and you’ll meet creme baumaniere. Add American bourbon, and you earn the right to name this child as well, as the French pastry masters haven’t done so yet. Perhaps my favorite, frangipane is the child of our mother pastry cream and sweet almond cream, a gentle girl who loves to play with stone fruits, pears, and apples. When in the country of Spain, pastry cream transforms into the secret filling of Basque cake. If you’re thinking of cake in the American sense, light, moist, with an open crumb, guess again. It’s more appropriate to call this a gateau, a cake in the most European sense; a dense, low rider of a cake, absolutely heightened by the moisture of a cup of coffee, sipped along side. I mentioned that pastry cream is vacant in American desserts, but that’s not entirely true. The Boston cream pie, which is in fact a cake, owes its custard center to pastry cream. Glazed with shiny dark chocolate, two rounds of sponge cake sandwich a quiet layer of vanilla flavored pastry cream. Boston cream pie may appears simple, but is grand enough to have become the official cake of Massachusetts, beating out another state creation, the Toll House cookie. Left in the hands of curious cooks, I’ve seen pastry cream battered and fried, for a molten dumpling this side of insanity. I’ve also seen it thinned down and frozen for something akin to a pudding pop. Which makes me wonder how it would behave in an ice cream machine. In a pinch it can be thinned into a sauce, taking on any additional flavors you can blend in. Not all recipes you’ll find are created equal, with nuances in the ratio added to favor the predicted purpose; thinner for tarts, thicker for mothering a child, and set with flour or cornstarch depending on the authors preference. As you can see, if the recipe you use doesn’t do exactly what you expected, there is no shortage of ways to transform your pastry cream. This pastry cream recipe has evolved from years of making several other chef’s recipes. I make use of two small appliances, a stand mixer to whip the eggs, sugar, and starch to extreme lightness, and a food processor to blend in the butter after cooking, a step that also eliminates any lumps that may occur. If you don’t have these machines, or prefer not to drag them out of storage, you can complete both of these steps by hand whisking. Finally, I have adopted Sherry Yard’s double-fisted stirring technique; a rubber spatula in one hand to scrape the sides and bottom of the pot where the starches thicken first, and a whisk, used gingerly to ensure smoothness of the custard without bashing the starches into gummy chains. Place the butter in a food processor and set it aside. Place the milk in a medium sized pot with a heavy bottom. Split the vanilla bean lengthwise and use the tip of your knife to scrape the tiny black seeds from the pot. Place both the pod, and the seeds in the pot with the milk, and place over medium high heat. When the milk comes to a boil, remove from heat and set aside, allowing the vanilla pod to infuse while you prepare the next step. Place the egg yolks, sugar, cornstarch, and salt in the bowl of a stand mixer. Whip these ingredients on high speed for two minutes, until the mixture is light and fluffy, and the egg yolks have turned a pale buttery yellow. After two minutes reduce the speed to low. Remove the vanilla pod from the pot of milk, and slowly drizzle the hot milk into the bowl. Aim for the space between the side of the bowl and the whip, this will reduce the risk of hot milk splattering onto you. Set the emptied pot aside to use again. When all the milk has been added, stop the mixer, and use a rubber spatula to scrape the sides of the bowl clean. Whip on low for 30 more seconds to reincorporate the thicker batter that was on the sides. Once the mixture is even, place a fine mesh strainer over the reserved pot, and strain the custard into the pot. Place the pot over medium heat, and grab a rubber spatula in one hand and a whisk in the other. Cook the custard over medium heat until it comes to a boil. While the custard is cooking, you’ll employ both of the utensils in your hand, scraping the bottom of the pot with the rubber spatula, pulling the custard away from the surface of the pot where it thickens faster. You will also whisk the custard, to ensure it is smooth through out the entire cooking process, but resist the urge to beat it with the whisk. A gentle controlled whisking is required, the starches in the custard are swelling with the increasing heat, and will burst if hit too hard with the whisk. The broken starches will start to cling together forming chains, which will result in a gummy pastry cream. When the pastry cream starts to boil, which looks more like the thick blurps of a thermal mud pit, set a timer for 30 seconds, and cook, whisking and scraping, until the timer goes off. After 30 seconds, immediately pour the hot pastry cream into the food processor with the butter. Pulse three to five times, until the butter is incorporated and the pastry cream is smooth, but no more! The added fat will help prevent the starches from forming gummy chains when agitated by the blade, but it can only do so much. Congratulations, you are now the proud parent of pastry cream! Do with it as you wish, whisk in chocolate, cast it into a tart shell, or let it set for future use. To do this, transfer the pastry cream to a shallow vessel; a wide-mouthed bowl or pie plate works well. Press plastic wrap directly on the surface of the pastry cream to prevent a skin from forming while it cools. The pastry cream needs to cool completely before it is used in another application. Not only will any residual heat from the warm pastry cream alter the texture of the added ingredients, but the starches need to completely set before they can be moved about again, or they will loose their strength. Once cool, the pastry cream can be scraped out of the shallow vessel and store in any airtight container for about three days. The starches will begin to break down if it is held much longer, making the pastry cream leaky. If this happens, you can bring it back together with some aggressive whisking, but its strength will begin to deteriorate.